Professor C.V. Vishveshwara, or Vishu as he is known to many of his friends, colleagues and students, was the first to explore the stability of black holes. Vishu’s work is fundamental to our understanding of black holes and began a new chapter in how to study them. Unfortunately, his work is not credited as much as it should be and this blog is about his seminal work, its relevance to the first discovery of gravitational waves and its implication for future studies of black holes. In his 1970 paper (Nature, Vol. 227, page 936) , Vishu explored how black holes respond to external perturbations. He showed that regardless of what the perturbation is black holes get rid of any deformation imparted to them by radiating gravitational waves and the radiated waves have a frequency and decay time that depended only on their mass. This result was later extended to spinning black holes which showed that imprint in the spectrum of gravitational waves from deformed black holes are their mass and spin frequency. This was a truly remarkable result as it meant that we could study the properties of black holes by perturbing them or deforming them. But how would one go about deforming a black hole! A pair of black holes in a binary evolve by emitting gravitational waves of ever greater amplitude and frequency. The emitted waves drain the rotational energy of the binary making the two black holes spiral in and eventually plunge towards each other. When two black holes come together and merge a new black hole forms that is initially highly deformed. At this moment the radiation that was all the time increasing in amplitude and pitch suddenly ends with a constant frequency and decays exponentially. These characteristic waves are technically termed quasi-normal modes, which is why Vishu, a great scientist with an equally great sense of humour and wit, calls himself “Quasimodo of black holes“. They are not unlike the dying tones of a bell struck with a hammer and are often called the ringdown radiation. 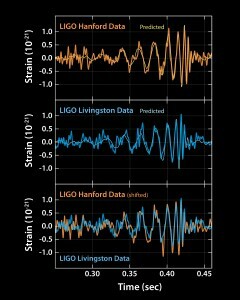 Characteristic chirp signal from a black hole binary observed by the LIGO detectors at Hanford and Livingston. The amplitude and frequency of the signal keep increasing but the signal suddenly terminates when the two black holes merge. 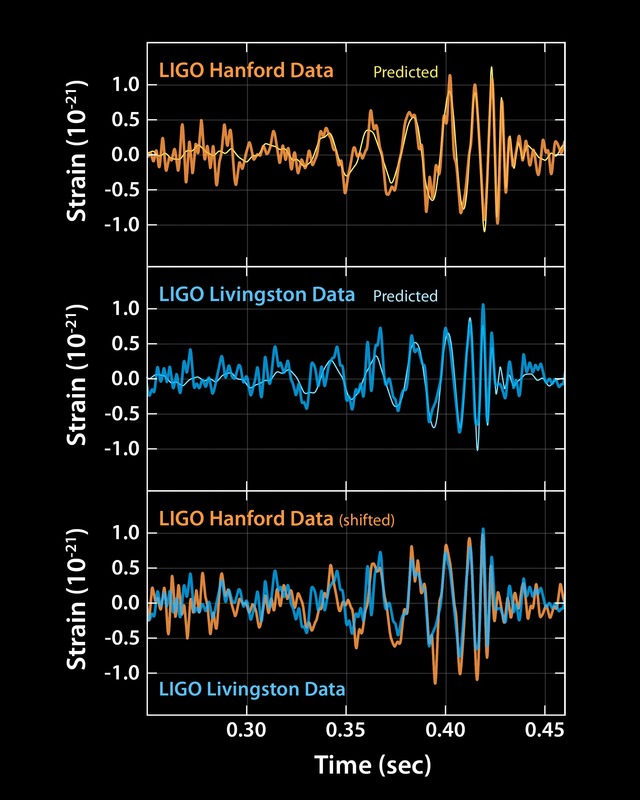 This is what we found at the end of a 200 millisecond-long gravitational wave signal, named GW150914, observed with the two LIGO detectors in Hanford and Livingston, on September 14, 2015. As far as we can tell the way the signal ends is completely in agreement with the prediction Vishveshwara made almost five decades ago. In 1975 I was struggling to decide what I should study at the University: engineering, music or physics. 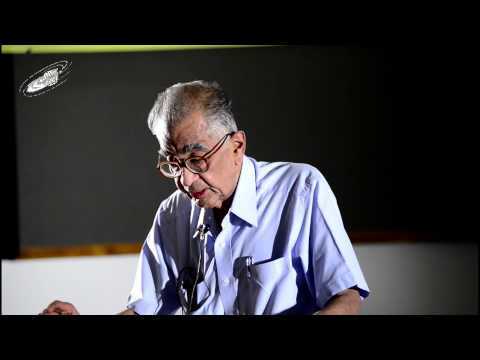 It was Vishu’s public lecture during a science festival at our college in Bangalore, that helped me resolve my dilemma and motivated me to pursue physics. That’s why in a book dedicated to honour Vishu on his sixtieth birthday in 1997 that I wrote “I will consider myself to be most fortunate if some day I can come and tell you that we have seen the quasi-normal modes to conclude your quest on the trail of a black hole and to begin a new era in gravitational astronomy”. I am so glad I was able to do that earlier this month. GW150914 is the first of what we expect to be a myriad of other binary black holes we hope to observe as LIGO detectors improve in sensitivity and other detectors like Virgo, KAGRA and LIGO-India, join the force over the next decade. Some of those signals will be strong enough to not just get a glimpse of quasi-normal modes but to actually confirm that they consist of a spectrum of modes that is consistent with the mass and spin of the black holes that emitted the signal. Still further in the future, with Einstein Telescope or Laser Interferometer Space Antenna we will observe even stronger quasi-normal modes, which should reveal the properties of the parent black holes, hence proving that black holes have memory. Confirming this would be a further testament to Einstein’s theory of gravity. This entry was posted in Personalities, Science on February 27, 2016 by Bangalore Sathyaprakash. This past week has been surrealistic. You work on accomplishing something that neither you nor your esteemed colleagues believe could be fulfilled in your lifetime, but finally when it does happen you don’t realise its full significance. This is what happened to many of us with the detection of gravitational waves. We have been working on this for decades. For five months from the day of discovery to its public dissemination, we were busy making sure what we have detected is not an instrumental artefact or an unintentional or a malicious tweaking of the instruments to make it look like an astrophysical signal. We were also busy writing the 13 papers that we wanted to make public on the day of the announcement. Two days before the press conference we were still arguing about contents of the various papers. Many of us paid little or no attention to how we would go about media coverage and what we would say about the discovery, its significance and social impact. The media coverage of this discovery has been unbelievably vast, deep and pretty much accurate. We not only received unprecedented media coverage but also broke previous records for how long a scientific story stayed as prime news in social media, blogs and newspapers. It is particularly amazing when you see its mention in a sports story, inspires a new soup recipe or rap music. To quote Kip Thorne, we are soon becoming part of the culture. I haven’t understood how this discovery caught the imagination of the media, the public and an outburst of coverage. Perhaps it was a combination of rumours that preceded the announcement , the name of Einstein associated with the prediction, the black holes that were behind the discovery which are always a topic of fascination for everyone, or perhaps the large collaboration of 80 institutions in 15 countries that helped spread the word. But what does this discovery really mean for the general public and does it have any impact on their daily lives? In a talk we presented to students, staff and the general public at Cardiff University on 17 February 2016, a question from the audience was “This is a big discovery alright; but what’s in it for me?” I was a bit harsh when I said “Honestly, nothing”. I did go on to add that the impact of scientific discoveries take decades or centuries to realise. I believe it is too soon to state why anyone should care about this discovery. There are spin-offs arising both from instrumentation, theoretical modelling and data analysis algorithms that were used in this discovery. The passion for solving intractable problems drives scientists and engineers to take the extra step that is necessary to solve them and these spin-offs are seldom realised on their own. So funding pure science is definitely worth for humanity even though the main goal of scientific endeavour is to gain a deeper understanding of how the Universe works; it is driven by basic human instinct and curiosity. It is not driven by noble, altruistic thoughts to incur benefits to other human beings. If we try to justify pursuit of scientific knowledge based on impact we might be treading on a dangerous path. Scientific discoveries, such as the dynamite, atomic bomb and the internet, have had both destructive and constructive impacts. Scientists are neither interested nor capable of managing societal impact of scientific discoveries and they are best left to people who are more knowledgeable. There are exceptions, of course, and Einstein himself was a tremendous force in shaping how scientific discoveries are put to use, although he is believed to have regretted his influence on the development of the atomic bomb. However, I think this discovery will have great cultural and sociological impacts. What this discovery has shown us today is that technology is only limited by fundamental physics principles. We can keep pushing the boundaries to achieve remarkable feats. What we have discovered is a mammoth achievement for not only science but also for engineering, computing, material science, etc. I also hope that this will be inspirational for students to pursue careers in science. The progress in science is slow but rewards, when they do come, are unmeasurable. It is not just an intellectual exercise but it is an adventure and the desire to go where no one has gone before and that journey has just begun. This entry was posted in Science and Socity on February 20, 2016 by Bangalore Sathyaprakash. On September 14, 2015 we made the first direct observation of gravitational waves. This signal has been given the name GW150914, GW standing for Gravitational Waves followed by the date when it was observed. Before this discovery the only fundamental waves we knew were light, radio waves, x-rays, gamma-rays, …, that are all electromagnetic waves of different frequencies, whose theory was worked out by James Clark Maxwell 150 years ago and their existence confirmed 22 years later by Heinrich hertz. In 1916 Einstein showed that similar to electromagnetic waves of Maxwell’s theory, gravitational waves existed in his theory of gravity. By now everyone knows the buzz phrase: gravitational waves are ripples in the fabric of spacetime. But what does it mean? The curvature of space is defined by the distance between fixed points in space. In the absence of gravitational waves this distance, as measured by, say, how long it takes for a ray of light to get from one point to another, remains fixed. In the presence of gravitational waves, the distance changes and the time of flight of light between the fixed points varies by a tiny amount. That is what LIGO detectors have measured. GW150914 caused a change in distance one-one thousandth the diameter of proton and so we had had to make sure that myriad other causes did not make this change. This was helped greatly by having two LIGO detectors that were separated roughly by 3,000 km and by a theoretical understanding of how gravitational waves from a pair of colliding black holes look like. The signal lasted for a fifth of a second in our detectors taking 7 milliseconds to pass from the LIGO Livingston detector in Louisiana to the LIGO Hanford detector in Washington. At the beginning of our observation the frequency was 30 Hz or the black holes were orbiting 15 times around each other. At the end of 200 milliseconds, the frequency was 250 Hz and they were orbiting 125 times around each other. In the end the horizons of the two black holes collided travelling at half the speed of light. Here is (a processed) audio file to tell you what the signal sounds like. Secondly, this is the first time anyone has directly observed a pair of black holes (see below for arguments why we think these should be black holes) in orbit around each other. From the observed gravitational waves we are able to deduce the masses of the black holes just before they merged and we found them to be 29 and 36 times the mass of the Sun, give or take a few. Although astronomers had speculated that such binaries should exist no one had observed them before. This is not surprising because binary black holes of this type are not expected to emit any light, x-rays or radio waves and the only way of observing them is via gravitational radiation they emit. From the strength of the signal we were also able to determine the distance to the source and we estimate it to be roughly 1.3 billion light years away, give or take a few hundred million light years. Thirdly, we have for the first time observed the formation of a black hole. The signal that we observed was ramping up in amplitude and frequency from 30 Hz but died almost completely after reaching 250 Hz in less than one-fiftieth of a second. So here was a signal that was going up and up, rose to a crescendo, and completely died in an instant. Given the masses we have measured, the only interpretation that is possible is that we have a pair of black holes that were in orbit. When they came together and merged the signal stopped completely. How exactly the signal should terminate was worked out by C.V. Vishveshwara in 1971. As far as we can tell the signal we have detected has the characteristics of the death of two black holes and the birth of a new one. This has allowed us to test Einstein’s general relativity in ways that were not possible before. It turns out that the final black hole has a mass of about 62 solar masses, implying that about 3 solar masses were converted in the process of inspiral and merger of the two progenitor black holes. That is a colossal amount of energy but most of it was released during the last few cycles with the luminosity in gravitational waves reaching 50 times that of the entire Universe in light for a brief moment. What is the significance of our discovery? GW150914 opens up a new window for observing the Universe. I have read in the media greatly exaggerated claims that this is the first great discovery in physics since Heinrich Hertz’s experiment 125 years ago and the first great advance in astronomy since Galileo Galilei pointed his telescope towards Jovian satellites 400 years ago. The truth is perhaps not far from this exaggeration. Improvement in LIGO’s sensitivity over the next 3 years and addition of new detectors in Europe (Virgo), Japan (KAGRA) and India (LIGO-India) will allow us to survey a volume of the Universe that is 30 to 100 times more than the current setup does. The improved gravitational wave detector network should detect one such merger every day. But we also expect to observe colliding neutron stars, supernovae, and other sources which will help us gain deeper insight into matter under extreme conditions of density and gravity and help deduce the equation of state of dense nuclear matter. In essence, gravitational waves will be a new tool for fundamental physics, astrophysics and cosmology. This entry was posted in Science on February 15, 2016 by Bangalore Sathyaprakash.